Amidst the chaos comes a comic! Things are busy here in the New Legend offices as we are preparing for the San Diego Comic Con (we'll be in Small Press table L-14), but I had to pause for a moment when a comic I recently purchased on eBay arrived in the mail. I was introduced to the character of Russell Stamm's Invisible Scarlet O'Neil six years ago and she has become a very important character in my life. I have been searching for a decent copy of her first appearance in comics and finally pulled the trigger. Famous Funnies #81 marks the debut of the newspaper reprints starting with Scarlet's origin. Dated April 1941, it is an important and historical issue and now the oldest in my collection. Perhaps even more than that, it features an absolutely gorgeous cover by H.G. Peter, who would go on to illustrate Wonder Woman. 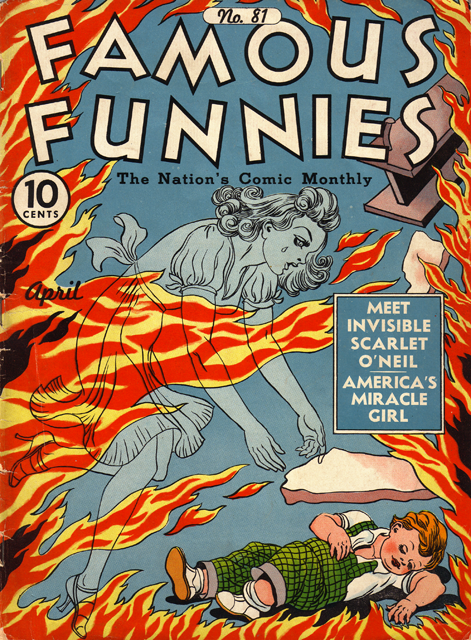 As I complete the final proofs for the new Invisible Scarlet O'Neil graphic novel, it is fitting to take a moment to remember where she came from. It is my hope that her re-introduction is as exciting as her comic debut 71 years ago. In a few days, I'll be posting the cover to the new graphic novel and you can judge for yourselves. 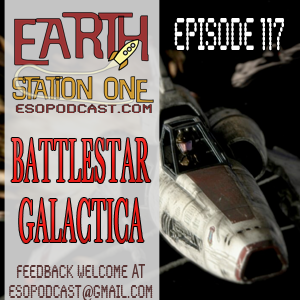 On this episode, Earth Station One flees from the Cylon tyranny on a lonely quest – to discuss the shining sci-fi franchise known as Battlestar Galactica. Joining the rag-tag crew of Mike, Mike, and Bobby is Dan Carroll. Or at least we think our guest is Dan. He may in fact be a Cylon! We also check in with writer and publisher Tommy Hancock and find out details on the new Tales of the Rook anthology. All this, plus the usual Rants, Raves, Khan Report, and Shout Outs! So say we all! Next week, the Earth Station One discusses our favorite movies that actually surpass the original material they were based on. Sometimes, just sometimes, the movie is better than the book! ESO wants to hear from you! Do you know of an adaptation that was better than the source? Let us know at www.esopodcast.com, at the ESO Facebook Group, email us at esopodcast@gmail.com, or call us at 404-963-9057 with your comments. We just might air yours on the show! Enter Tom Baker and his amazingly long run as The Fourth Doctor! It all begins with Robot. Mike, Mike, and Dave are joined by Rondo Award-Winning Artist of the Year Mark Maddox for a look at Baker’s first performance as The Doctor and discuss what made him the icon that many people still think of today as the face of the franchise. 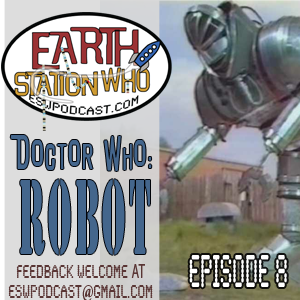 This week, the Earth Station One crew once again takes a timey-whimey ride in the TARDIS for a look at those lucky enough to share a ride with The Doctor. Join Mike, Mike, Bobby, and William along with Jason and Rita from the Transmissions from Atlantis podcast and Mary Lou Who as we discuss our favorite and least favorite Who companions. Plus we also chat with Daniel Emory Taylor and Jim O’Rear about their latest project and Jim gets caught in The Geek Seat! All this, plus the usual Rants, Raves, Khan Report, and Shout Outs! Next week, the Earth Station One flees from the Cylon tyranny with a rag-tag crew on a lonely quest - to discuss the shining scifi franchise known as Battlestar Galactica. ESO wants to hear from you! What are your favorite and least favorite Battlestar Galactica moments? Are you more a fan of the recent series or do you prefer original BSG? Let us know at www.esopodcast.com, at the ESO Facebook Group, email us at esopodcast@gmail.com, or call us at 404-963-9057 with your comments. We just might air yours on the show! This weekend, I'll be at HeroesCon, one of my favorite conventions of the year. This year, the Charlotte show celebrates its 30th anniversary and promises to be better than ever! 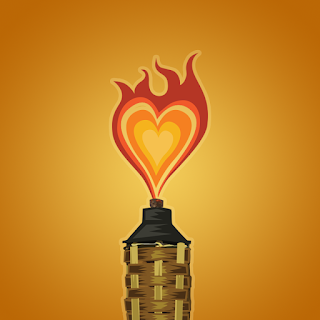 I will be at Artist Alley table #451, which is near "Indie Island," so if you're touring the island, keep an eye out for the tiki! Alongside me will be artist Peter Cutler, artist of Tiki Zombie, who will be available for sketches all weekend. I'll also have some limited quantities of the Crypto Zo Convention Special, so be sure to come by and get one while supplies last! Hope to see y'all there! 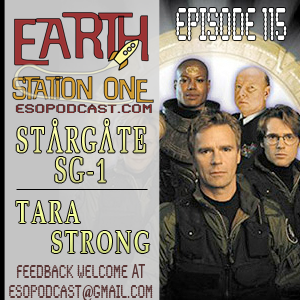 The Earth Station One crew once again steps through the event horizon and into adventure with Stargate SG-1. Mike, Mike, and Bobby with guests Dave Slotter, Tracey Dawn Allgrove, and Andrew Leiter uncover the secrets of Stargate Command from the series that launched a sci-fi franchise. Plus, a Khan report from the Knoxville Comic and Anime Show featuring an exclusive interview with Tara Strong! All this and the usual Rants, Raves, and Shout Outs! 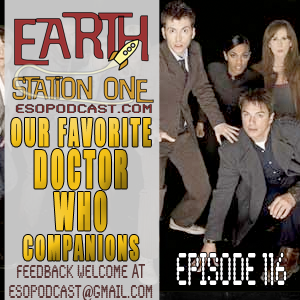 Next week, the Earth Station One crew once again takes a timey-whimey ride in the TARDIS for a discussion on our favorite, and least favorite, Doctor Who companions. Sound off, Whovians! ESO wants to hear from you! Who are your favorite and least favorite companions, and why? Let us know at www.esopodcast.com, at the ESO Facebook Group, email us at esopodcast@gmail.com, or call us at 404-963-9057 with your comments. We just might air yours on the show! 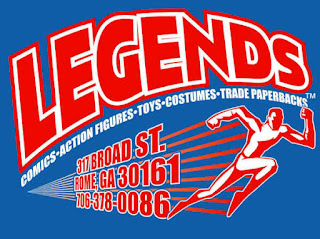 This Saturday (6/9), New Legend comes to Legends! I will be at the Rome, GA comic shop from Noon until 2pm signing copies of Tiki Zombie #1, along with two "legends in their own minds," Bobby Nash and Sean Taylor. Can one shop hold these three egos? Come on by and find out! After the signing, Bobby and I will travel to Tennessee to appear at the Knoxville Comic and Anime Show! We may not make it to the con on Saturday, but Mike Faber will be representing the Earth Station One podcast hosting panels and meeting fans. Bobby and I will be there all day Sunday (6/10) at the ESO table promoting the podcast and having copies of our own books available. I've never been to either area, so I'm looking forward to seeing the sights and meeting new folks! If you're nearby, feel free to stop by and say, "Howdy!" ESO REASSEMBLE!!! This week, the ESO crew follows up on The Avengers movie review to focus on the long-running comic series that inspired one of the biggest blockbusters of all-time. Mike, Mike and Bobby are joined by Van Allen Plexico (www.AvengersAssemble.net) to discuss what makes this band of Marvel misfits the "Earth’s Mightiest Heroes." 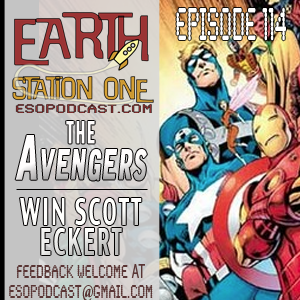 We also interview writer/editor Win Scott Eckert as he takes a turn in The Geek Seat. And we are proud to introduce the newest podcast to the ESO Network family, Transmissions from Atlantis with hosts Jason and Rita de la Torre! All this, plus the usual Rants, Raves, Khan Report, and Shout Outs! Next week, the Earth Station One crew once again steps through the event horizon and into adventure with Stargate SG-1. Join us as we uncover the secrets of Stargate Command from the beginning of the series that launched a sci-fi franchise. ESO wants to hear from you. What are your favorite Stargate SG-1 stories and why? Let us know at www.esopodcast.com, at the ESO Facebook Group, email us at esopodcast@gmail.com, or call us at 404-963-9057 with your comments. We just might air yours on the show! ESW Live! Recorded panel at TimeGate 2012 features Mike, Mike, and Dave with special guests Scott Viguie (Articles of the Shadow Proclamation podcast) and Rebecca Perry (TheOneRing.net) as they reveal what goes on behind the scenes creating the podcast and why they feel it is important to look at the past of Doctor Who to fully appreciate the present and future. Thanks to all who attended the panel and the fantastic TimeGate staff! We look forward to returning in 2013! 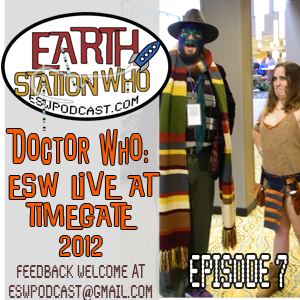 This past weekend, the Earth Station One crew had a grand ol’ time at the TimeGate convention in Atlanta, GA! 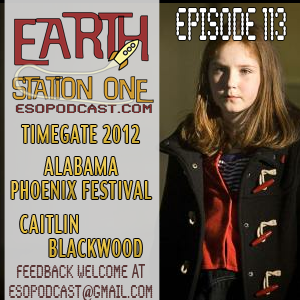 Mike, Mike, and ESW co-host Phantom Troublemaker were featured panelists on a variety of topics and even got the chance to sit down for a few minutes with Caitlin Blackwood (Amelia Pond on Doctor Who). We also visited with Friends of the Station new and old and we thank all those who helped make the weekend so enjoyable! Meanwhile, Bobby Nash travelled to Birmingham, AL and he shares his great memories of the debut of the Alabama Phoenix Festival. Next week, the crew once again answers the call: "ESO ASSEMBLE!" In part 2 of our look at the Avengers, we move from the big screen blockbuster to the comics that started it all. Joined by noted Avengers fan Van Allen Plexico, ESO recounts their favorite comic book stories featuring Earth's Mightiest Heroes. What are you favorite Avengers story lines, creative teams, and lineups? Let us know at www.esopodcast.com, at the ESO Facebook Group, email us at esopodcast@gmail.com, or call us at 404-963-9057 with your comments. We just might air yours on the show!